Who knew there was such a thing as having too many bananas! Those familiar with my Going Bananas blog know I usually buy a branch with around 100 bananas on it every week. Sometimes, I have so many ripe bananas on the branch at home, that I dry and store them for tasty snacks. This magical mixture of bananas, nuts, coconut and chocolate is so delicious, made from healthy organic raw ingredients, and without wheat, milk or sugar, that it will surely be a keeper for decades to come. Banana Bliss Bombs take about ten minutes to make and are a fantastic standby when you need a plate of something delicious to take to a party or gathering. In a food processor, place the cacao beans and process for a minute or so until the beans become powdery. Add the cashews and almonds and process for another minute. At this point, add the bananas and blend into the chocolate and nuts. Now, add all the seeds at once and the coconut oil. Blend well. Add the honey last and blend until the mixture forms a soft ball. 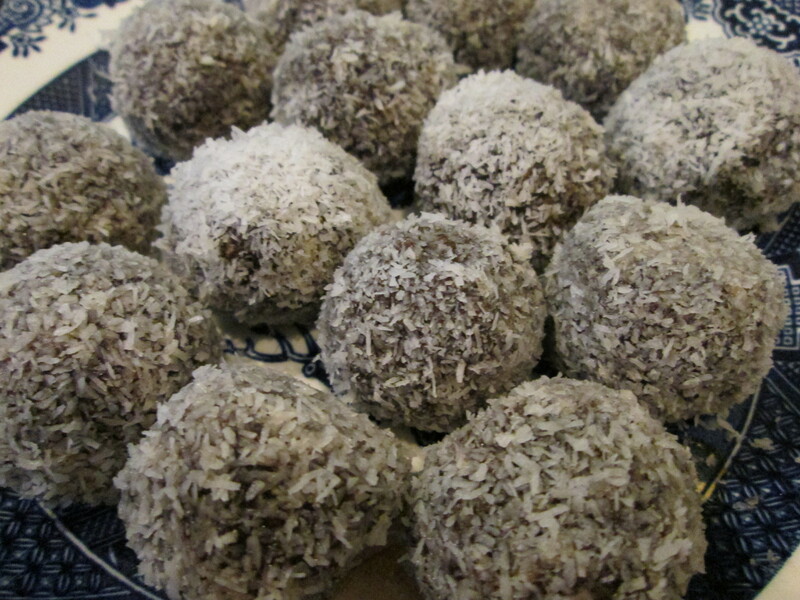 Roll teaspoonfuls of the mixture into balls and roll in desiccated coconut. This should make around 14-16 balls. Place the bliss bombs into the refrigerator for around half an hour before serving. NOTES: For nut allergies, use 1/2 cup of desiccated coconut instead. To learn about Organic and Traditional Cooking Classes in Ecuador, get in touch.